Red curry paste is so versatile, fragrant and not too hot for my family. I often use it to make pork, chicken and seafood dishes. Red curry paste is also a perfect match with beef brisket. A friend of mine once told me that she loves eating beef brisket as it’s full of beef flavour. However, she’d be put off from it if it’s too fatty. 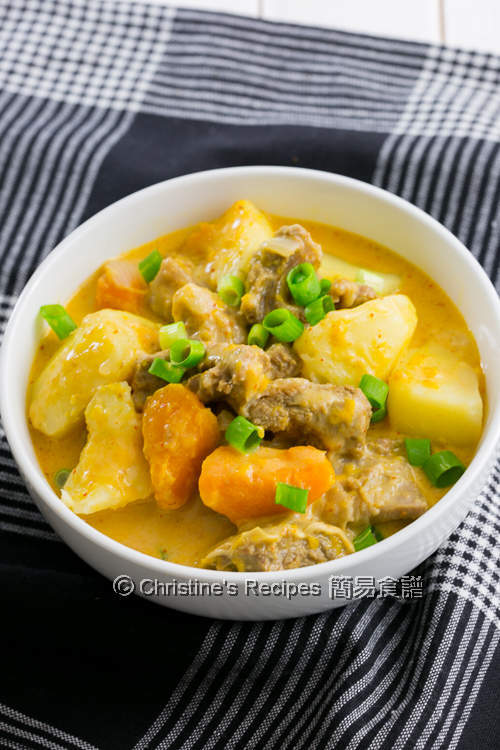 If you’re armed with an oil separator or the simple tricks written below this recipe, you’ll make this dish again and again, simply because this beef brisket curry dish is wonderfully tasty. It’s worth the effort. Trim away the fat from beef brisket if any. Blanch in boiling water to remove blood and impurities. Drain well. Cut into 4- to 5-cm (1½- to 2-inch) chunks in length. Set aside. Press “Saute” button, heat oil on medium heat. Saute the ginger, garlic and red curry paste. Add half of the onion (keep the rest for later use). Stir and cook the beef brisket until aromatic. Add the carrot, star anise and bay leaves, rock sugar and water. Close the lid. Turn the steam release handle to the “sealing” position. Press “manual” button, cook on high pressure for 25 minutes. Run quick release. (I used an oil separator to get rid of the oil from the . Return the sauce into the pot. Or you might like to let it cool down and chill in fridge. The fat will be solidified on surface. It’s easily spooned away. Or you might like to skip this step if you get lean meat.) Add potatoes and the remaining onion. Close the lid again, with “sealing” on. Cook on high pressure for 15 minutes. Then select “saute”. Pour in the seasonings. When it boils, pour in the coconut milk. When it almost boils, turn off the power. Discard the bay leaves. Serve hot. Follow the above instructions to prepare all the ingredients. But, prepare 1 more cup of water. Use a large heavy-based pot to heat oil. Saute the ginger, garlic, red curry paste. Add half of the onion (keep the rest for later use). Add the beef brisket and heat it up. Stir occasionally. Add the carrot, star anises, bay leaves, rock sugar and water. Cover and bring it to boil. Reduce heat and simmer for 1½ hours. Refill with boiling water if needed. Cook until the beef brisket turns soft. If you like to remove the fat, follow the above instant pot method#3. Add in the potatoes and the remaining onion. Continue to cook for 20 to 25 mins. Pour in the sauce. When it boils, add coconut milk. Chuck steak or flank can be used instead. Get any cheap cuts you like. Trim the fat away before cooking. Or spoon out the oil on the sauce surface. I used an oil separator, similar to this one. Separate the oil before adding the potato. The beef brisket can be made in advance. Let it cool down and chill in fridge overnight. The oil will turn into solid. You can easily spoon it out and discard it. Then add in the potato and continue to cook. 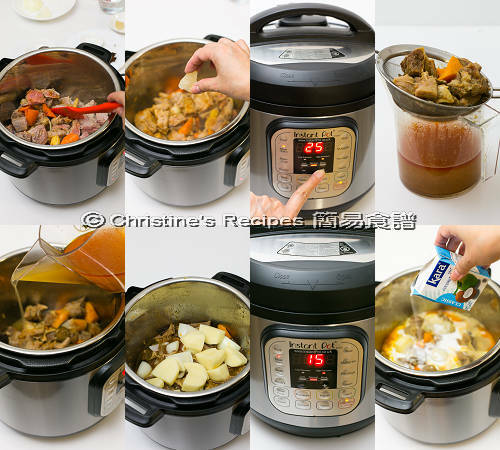 wow..another amazing instant pot recipe from you, Christine. 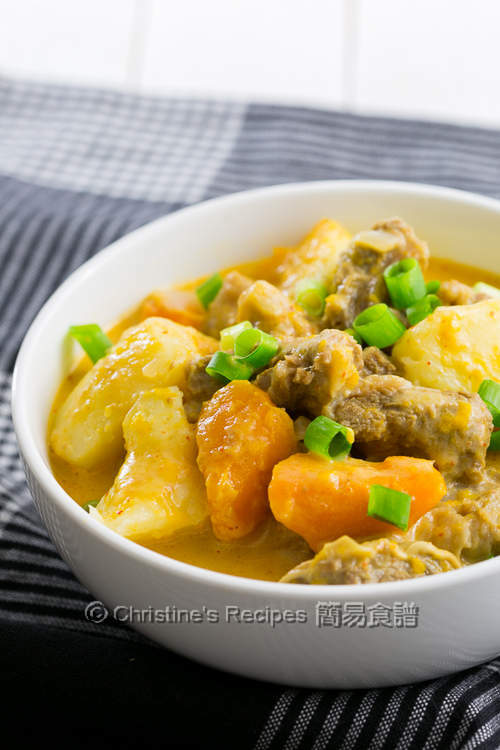 The curry looks wonderfully delicious and packed full of flavours.